Flaunting a signature beauty of its own, Kochi aka Cochin epitomizes an intriguing blend of tradition and history, sprinkled with a touch of modernization. With a touch of medieval Portugal, quaint Holland, and English hamlets, this port city on the tropical Malabar Coast basks in the glory of its heritage houses, ancient synagogue, and old mosques. 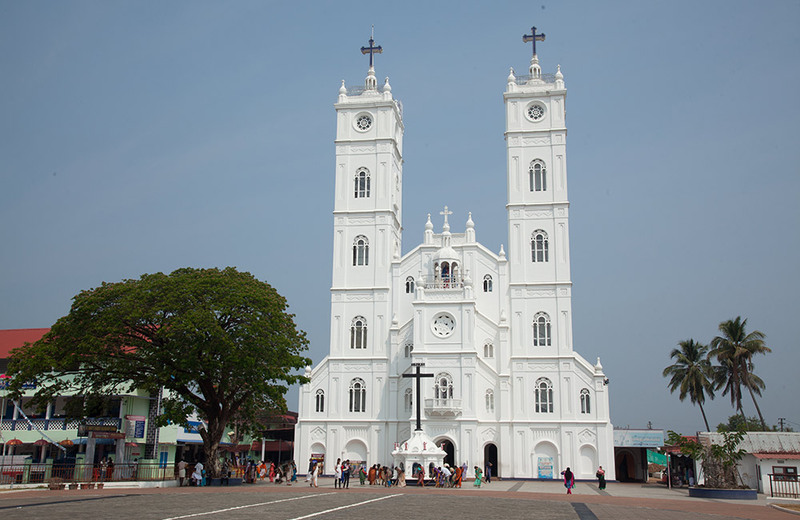 Not to forget the impressive churches of Kochi that are no less than architectural wonders! These historic churches are grand edifices that exude a hypnotic charm. Whether you are a religious person or not, a visit to these churches will leave you filled with awe and wonder and give you delightful insight into Kerala’s art and culture. So, are you ready to take a trip to these sanctuaries of God in God’s Own Country? 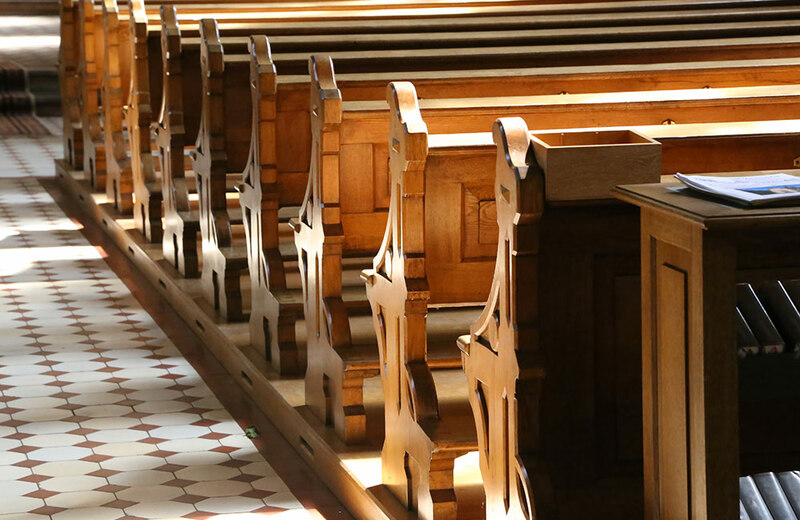 We bring to you a handpicked list of the most captivating churches that never fail to entice the travelers and explorers setting foot in Kochi. The Vallarpadam Church in Kochi is a magnificent white edifice dedicated to Mother Mary, who is fondly referred to as Vallarpadath Amma here. Legend has it that Vallarpadath Amma has miraculously saved her devotees a number of times from fierce storms rising in the sea. This shrine is also known as the Church of Our Lady Ransom and the National Shrine Basilica of Our Lady of Ransom. As per the local folklore, Paliyath Raman Valiyachan, the Prime Minister of the erstwhile Maharaja of Cochin, donated the land for the construction of this shrine. As such, a sanctuary lamp donated by the minister has been kept burning here since 1676 in honor of the generous minister. Considered to be the most significant Marian Shrine in the country, this Kochi church is also a major pilgrimage site in India. Thousands of pilgrims visit this place to take part in the annual Feast of Vallarpadath Amma that is celebrated from 16th to 24th September, every year. 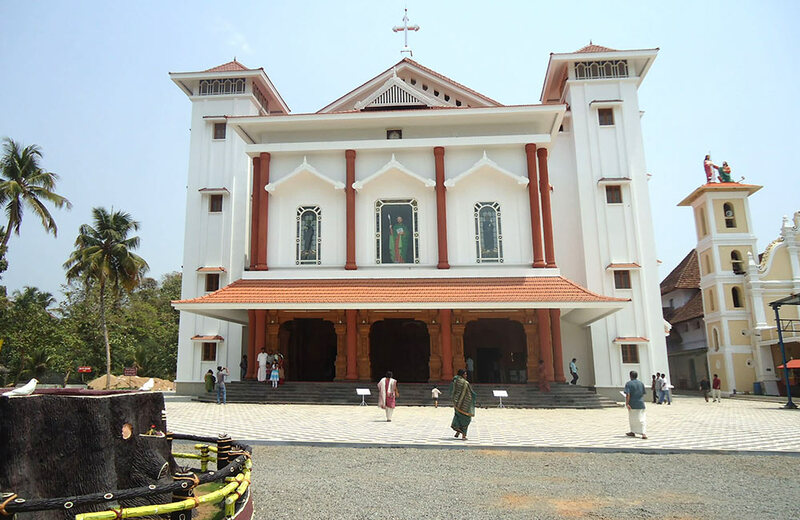 Situated in the north-eastern part of Kochi, the St. Thomas Syro-Malabar Catholic Church, popularly known as the Malayattoor Church is known to be among the most well-known religious places in the city. Interestingly, it also counts among the popular tourist places in Kochi. The shrine stands atop a picturesque hill and attracts visitors from not just Kerala, but all over India. It was St. Thomas, the apostle of Jesus Christ, who set up this church. He is credited to be the one who brought Christianity to Kerala. 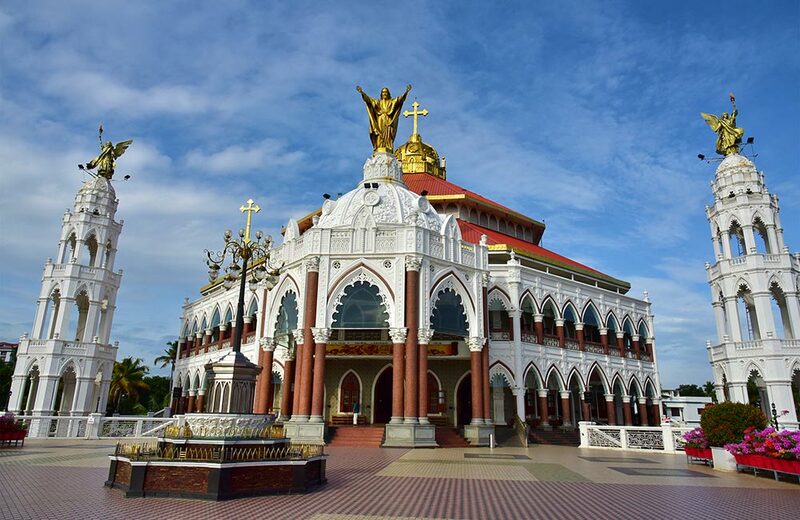 As of now, the Malayattoor Church has been entitled by the Vatican to be one among the eight international shrines across the world. There are a number of legends associated with this place of worship. One of them says that the footprint and knee marks of St. Thomas were imprinted on a rock on the hill, where the saint had prayed long ago. As per local rumors, a golden cross appeared at a spot on the hill where the saint had made a cross mark with his finger and prayed. Lores and rumors notwithstanding, the church remains as one of the most visited churches in Ernakulam and in the entire Kerala. It won’t be an exaggeration to describe the Santa Cruz Basilica as the most beautiful church in Kochi, Kerala. Located in Fort Kochi, it is among the eight basilicas in the country. This heritage shrine, founded way back in 1505, was originally built by the Portuguese, but was demolished by the British. In the year 1905, the present edifice was constructed and consecrated. Later, in the year 1984, Pope John Paul II proclaimed Santa Cruz as a Basilica. This place of worship attracts visitors all year round not just due to its historic and religious significance but also because of its artistic and architectural grandeur. Built in a spectacular Gothic and Indo-European style, the imposing edifice is ornamented with enticing frescos, murals, and paintings. 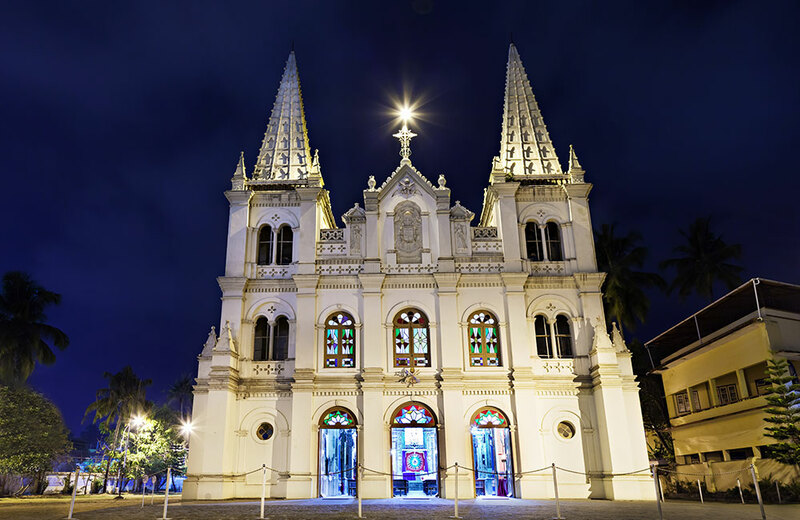 A visit to Santa Cruz Basilica definitely deserves a place in your list of things to do in Kochi. St. Francis Church is an old Christian shrine with an interesting history. 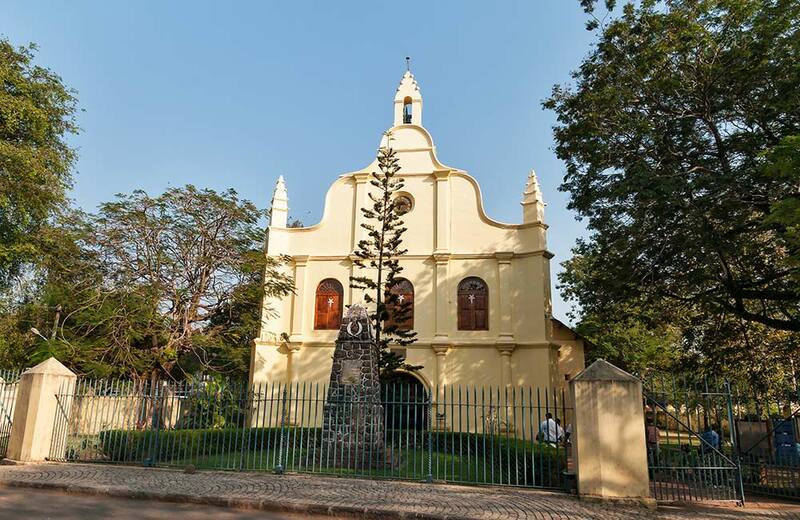 Originally constructed in 1503, this historic church has seen the ebbs and tides of the European colonial reign in the country. Initially, this shrine was built out of timber before it was reconstructed with stone and masonry in 1516. It is the place where the mortal remains of the famous Portuguese explorer Vasco da Gama were buried when he died in Kochi in 1524, but they were moved to Lisbon 14 years later. Even today, his gravestone can be seen within the church complex. Apart from its historic relevance, this shrine attracts visitors due to its aesthetic beauty. Its white exterior, timber-framed tile-covered roof, stained glasses, and lovely frescos, all lend the edifice a unique look. One of the famous churches in Kochi, Kerala, this shrine was declared a protected monument by the Archaeological Survey of India in 1923. St. Francis Church also has a cenotaph built to commemorate the residents of Kochi who lost their lives in the First World War. Do you fancy visiting a historic church that was once patronized by the royalty of the land? 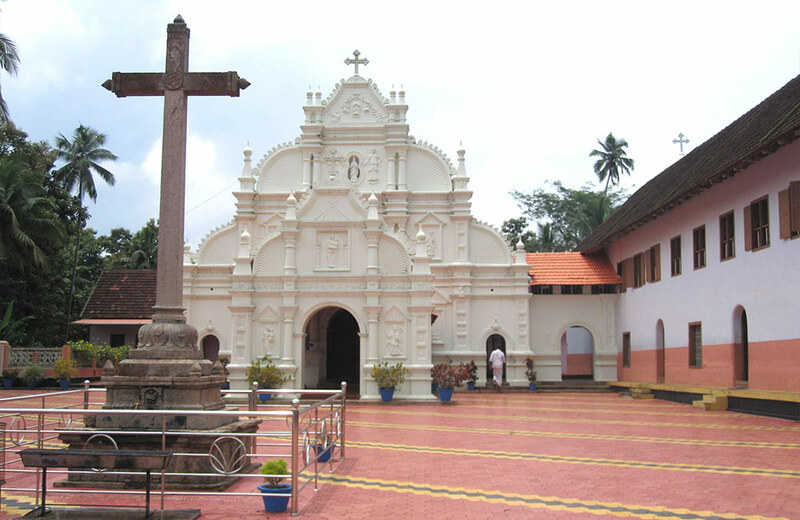 Then you must head to the Nadamel Marth Mariam Church in Kochi. It was a tradition for the heirs of the Cochin royal family to make an offering in person at this place when they ascended the throne. This church dates back to the 12th-century and was originally constructed by the congregation of Karingachira Church. Located in the serene neighborhood of Thrippunithura, the shrine holds much relevance for the Jacobite Syrians. Its white front façade and red-tiled roof paint a picture of beauty. It is the architectural grandeur of the edifice that draws maximum attention towards this heritage beauty of Kochi. And while you are in the city, do not forget to get a taste of the local delicacies offered by the best restaurants in Kochi. The Kadamattom Church is an ancient Christian shrine located in Kadamattom near Kolenchery, the easternmost suburb of Kochi. Standing at a distance of about 30 km from the city center, this well-known Malankara Jacobite Orthodox Syrian Church traces its origins to the 9th century. The church exhibits elements from Indian and Persian styles of architecture, which presents a pleasant sight to the visitors. One of the main attractions of this shrine is an ancient Persian cross built of stone that displays four arms with equal lengths. Each arm is endowed with floral patterns which were designed, according to local accounts, by Mar Sabor. He was a Persian high priest who is also credited with establishing this church. Each year, the church celebrates the Kadamattom feast in the month of February with much pomp and grandeur. The list of churches in Kochi, Kerala can’t be deemed complete without mentioning the name of the St. George Forane Church in Edapally. Also known as Edapally Church, this place of worship is located about 15 km from the city center. It is believed that the church was founded in the year 593 AD, which makes it one of the oldest churches in India. This historic shrine is regarded as the largest church dedicated to St. George in Asia. Since the water of the well adjacent to the church is considered to have healing powers, the shrine witnesses a footfall of more than 5 million visitors every year. What’s interesting about this shrine is that it is a popular pilgrimage destination for not just the Christians but non-Christians as well. Remarkably, this place of worship attracts unique offerings like chicken, eggs, and gold. The annual feast of Edappally St. George, held on 23rd April, is a grand affair that attracts millions of visitors from around the world. If you are planning to visit this city, include these churches in your travel itinerary just so that you can enjoy architectural grandeur and rich history in close quarters. Also, take out time to explore the pristine beaches near Kochi that are nothing short of wonders of nature. With so much on offer, you are sure to have a great time when you step out of your hotel in Kochi.